Yes I will give you a free copy for review. What this book tries to do is uncover the underlying source of energy for the universe. To me it's magnetism but there is more to it then that. Where can I send it too? But either way, you should still find some very helpful information in Magnetic Universe. cheers for those, thanks for updating about just finding the EU theory stuff. also that coral castle thing looks well interesting, considering how the hell did those ancient people move massive blocks. MattEU wrote: cheers for those, thanks for updating about just finding the EU theory stuff. It is really really really simple. Anyone can do it with a bit of iron and a perfectly balanced source of positive and negative charges. This could be a great achievement if it proves true. I would love to see this technology utilized again. If you skip to the chapter about 'How He Did It', you can read the 2000 words and get the idea. Take a look at the following coordinates in NW Australia. Virtually all of Western Australia is one giant geological iron deposit. It is very similar to Europa's surface right down to the Litchenberg patterning. how the hell did those ancient people move massive blocks. Wallace T. Wallington can tell you. He has educated The Great Dog using simple mechanics. No, the Europan rilles are not cracks in the ice, they are overlying and intersecting V-shaped troughs. The dark color appears to be strings of small craters with dark material in their centers. A narrow discharge channel exploding beneath the surface will throw material onto the sides of the trench. The narrow lines of dark material at the base of the channel mark out what was acted on by the discharge—smashing oxygen atoms into atoms of sulfur. The lighter material is ice that was above the discharge channel, blown out to the sides. * Look through the subject archive at http://thunderbolts.info/tpod/00subjectx.htm and you can find TPODs on Europa, which repeat what the Great Dog quoted and much more. Spectrograms show that the white of Europa is mostly ice and the red is logically sulfur, which transmutes from the oxygen in the H2O of the ice, under electric discharge conditions across the surface of the moon. Europa, Jupiter's icy moon, meets not one but two of the critical requirements for life, scientists say. For decades, experts have known about the moon's vast underground ocean — a possible home for living organisms — and now a study shows that the ocean regularly receives influxes of the energy required for life via chaotic processes near the moon's surface. Scientists discussed the implications of the new study, which appeared online Wednesday (Nov. 16) in the journal Nature, at an afternoon press briefing at NASA headquarters in Washington. Lead author Britney Schmidt, a geophysicist at the University of Texas at Austin, explained that her team studied ice shelves and underground volcanoes on Earth in order to model the formation of odd features called "chaos terrains" that appear all over Europa. The researchers determined that it was heat rising from the moon's deep subterranean ocean and melting ice near the surface, creating briny lakes inside the moon's thick ice shell, that may have caused the collapse of these roughly circular structures above them. that her team studied ice shelves and underground volcanoes on Earth in order to model the formation of odd features called "chaos terrains" that appear all over Europa. The researchers determined that it was heat rising from the moon's deep subterranean ocean and melting ice near the surface, creating briny lakes inside the moon's thick ice shell, that may have caused the collapse of these roughly circular structures above them. We see circular chaos on the Sun come and go every day or solar month, in spades. Can you separate magnetic flux from red heat,in a sea of plazmy brine, the flux from the radiant heat ? #4 may have concentric rings and #8 definitely does. * How should the features of an ice crater differ from those of a rocky crater, whether the crater is formed by electric discharge or bolide impact? Ice should melt much more readily, but would it melt more from ED or a bolide? - Dr.Schenk found that the shapes of Europa's larger craters differ significantly from similar-sized craters on Ganymede and Callisto. His measurements show that this begins with craters larger than 8 kilometers in diameter. The difference is caused by the warming of the lower part of Europa's less-thick ice shell by the ocean. Warm ice is soft and flows relatively quickly (as in glaciers on Earth). - Craters larger than ~30 kilometers show even more dramatic differences. 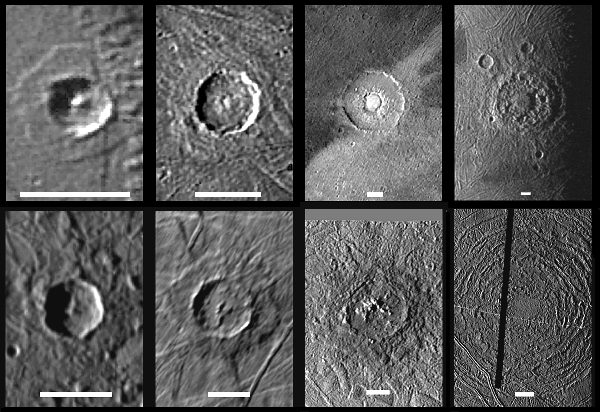 Craters smaller than this are several hundred meters deep and have recognizable rims and central uplifts (standard features of impact craters). Craters on Europa larger than 30 kilometers have no rims or uplifts and have little topographic expression. Instead, they are surrounded by sets of concentric troughs and ridges. This observation implies a fundamental change in the properties of Europa's icy crust at increasing depths. The most logical is a transition from solid to liquid. The concentric rings may be caused by wholesale collapse of the crater floor. As the originally deep crater hole collapses, the material underlying the icy crust rushes in to fill in the void. This inrushing material drags on the overlying crust, fracturing it and forming the observed concentric rings. * The EU explanation of rings is more plausible. It's interesting that large craters on other icy moons differ from those on Europa, if Dr. Schenk's findings are correct. I wonder if it does mean that there's water under Europa's thick ice. His estimate is that it's at least 19 km thick. * I wonder how conventional astronomers explain the brown coloring. Thornhill explains it as electrical transmutation of oxygen in water to sulfur, I believe. * This seems to have the concentric rings and it's not as circular as most other craters, it seems. 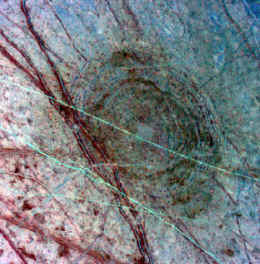 * There's a long light-colored linear mark all the way across the crater, so that mark would be younger than the crater. The dark auburn double lines on the left of the crater are also younger than the crater, but older than the light-colored mark. And the crater is younger than the other marks that it partly obscures. * I wonder what the blue coloring of the ice is from. I don't think there's sky on Europa. Maybe ice tends to look blue over long stretches of terrain. * This image from Callisto, another icy Jupter moon, seems to show crater splashes that were quick-frozen in place. * Here's a hexagonal one with a similar vertical splash-like rim. In November and December 2012 the Hubble Space Telescope (HST) imaged Europa’s ultraviolet emissions in the search for vapor plume activity. We report statistically significant coincident surpluses of hydrogen Lyman-α and oxygen OI130.4 nm emissions above the southern hemisphere in December 2012. These emissions are persistently found in the same area over ~7 hours, suggesting atmospheric inhomogeneity; they are consistent with two 200-km-high plumes of water vapor with line-of-sight column densities of about 1020 m−2. Nondetection in November and in previous HST images from 1999 suggests varying plume activity that might depend on changing surface stresses based on Europa’s orbital phases. The plume was present when Europa was near apocenter and not detected close to its pericenter, in agreement with tidal modeling predictions. NASA’s Hubble Space Telescope has observed water vapor above the frigid south polar region of Jupiter's moon Europa, providing the first strong evidence of water plumes erupting off the moon's surface. Previous scientific findings from other sources already point to the existence of an ocean located under Europa's icy crust. Researchers are not yet fully certain whether the detected water vapor is generated by erupting water plumes on the surface, but they are confident this is the most likely explanation. Should further observations support the finding, this would make Europa the second moon in the solar system known to have water vapor plumes. “By far the simplest explanation for this water vapor is that it erupted from plumes on the surface of Europa,” said lead author Lorenz Roth of Southwest Research Institute in San Antonio. "If those plumes are connected with the subsurface water ocean we are confident exists under Europa's crust, then this means that future investigations can directly investigate the chemical makeup of Europa's potentially habitable environment without drilling through layers of ice. And that is tremendously exciting." Hubble spectroscopic observations provided the evidence for Europa plumes in December 2012. Time sampling of Europa's auroral emissions measured by Hubble's imaging spectrograph enabled the researchers to distinguish between features created by charged particles from Jupiter's magnetic bubble and plumes from Europa's surface, and also to rule out more exotic explanations such as serendipitously observing a rare meteorite impact. The imaging spectrograph detected faint ultraviolet light from an aurora, powered by Jupiter’s intense magnetic field, near the moon’s south pole. Excited atomic oxygen and hydrogen produce a variable auroral glow and leave a telltale sign that are the products of water molecules being broken apart by electrons along magnetic field lines. Roth suggested that long cracks on Europa’s surface, known as lineae, might be venting water vapor into space. Cassini has seen similar fissures that host the Enceladus jets. Also the Hubble team found that the intensity of the Europa plumes, like those at Enceladus, varies with Europa’s orbital position. Active jets have only been seen when the moon is farthest from Jupiter. The researchers could not detect any sign of venting when Europa is closer to Jupiter. One explanation for the variability is that these lineae experience more stress as gravitational tidal forces push and pull on the moon and open vents at larger distances from Jupiter. The vents are narrowed or closed when the moon is closest to the gas-giant planet. The Europa and Enceladus plumes have remarkably similar abundances of water vapor. Because Europa has a roughly 12 times stronger gravitational pull than Enceladus, the minus-40-degree-Fahrenheit (minus-40-degree-Celsius) vapor for the most part doesn’t escape into space as it does at Enceladus, but rather falls back onto the surface after reaching an altitude of 125 miles (201 kilometers), according to the Hubble measurements. This could leave bright surface features near the moon’s south polar region, the researchers hypothesize. We report STIS spectral images of Europa’s trailing/anti-Jovian hemisphere and leading hemisphere obtained in November and Decem-ber 2012, respectively. Previous observations, in 1999, targeted Europa’s trailing hemisphere (Table 1). The observations in 2012 were timed to coincide with the maximum variation of the Jupiter’s magnetic field orientation at Europa. With this configuration, spatially inhomogeneous yet time-variable emissions originating from the periodically changing magnetospheric conditions can be separated from time-stationary emis-sion inhomogeneities due to atmospheric anomalies. In the present dissertation we study the auroral emissions emanating from the tenuous atmospheres of Jupiter's satellites Io and Europa. The satellites are embedded in a dense magnetospheric plasma environment. Due to Jupiter's fast rotation the corotating magnetospheric plasma particles constantly flow past Io and Europa causing a complex interaction and triggering auroral emission in the atmospheres. Therefore, aurora observations are a useful tool to explore both the magnetospheric environment and the neutral gas clouds of the satellites. Io's aurora is characterized by bright emissions on the sub-Jovian and anti-Jovian flanks close to the equator and a fainter limb glow around the polar regions. 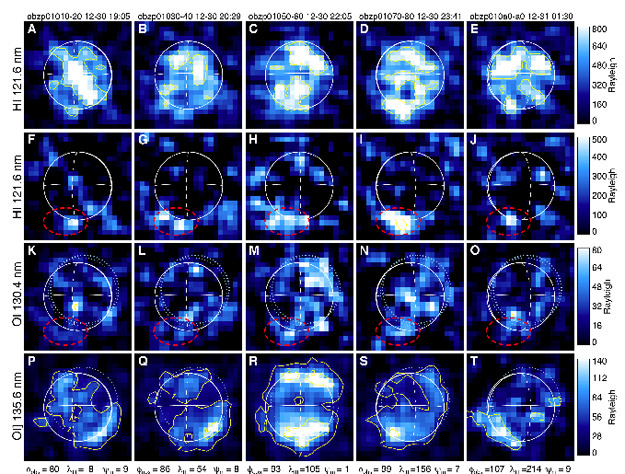 Analyzing the STIS images we demonstrate that the variations of Io's UV aurora observed over a period of five years can be attributed to changes in the magnetospheric environment as well as to the varying viewing perspective. Our results are a strong indication, that Io's atmosphere is driven by sublimation of SO2 frost rather than direct volcanic outgassing. The ultimate source for Io's atmospheric gas is widely debated for many years. We also investigate the observed variation or rocking of the bright auroral spots around Io's equator. The location of the spots has been shown to be correlated to the Jovian magnetic field orientation at Io. The exact correlation is, however, not 1:1, but is presumably affected by local perturbations of the magnetic field. We find that most emission is observed on the disk of Europa rather than around the limb like in comparable observations of Io's aurora. We show that an increasing O2 density towards the sub-solar point possibly explains the observed morphology as well as previous observations. While the OI] 1356 Å emission pattern appears to vary periodically in correlation with the changing magnetospheric environment, the OI 1304 Å morphology is clearly dominated by a very bright locally confined emission in the northern, anti-Jovian quadrant of Europa's disk. The location of this anomaly coincides exactly with the longitude, where a peak in water vapor production is predicted due to increased shear heating at the surface cracks. Estimating the emission brightnesses expected for a local water plume, we find that the observed UV emission intensities are principally consistent with a locally confined abundance of water vapor. However, due to observational uncertainties and since we have neglected the effects of the plasma interaction for the approximation of the H2O abundance, our results can not be seen as prove for the existence of water plumes on Europa. To accurately determine the effects of an asymmetric O2 atmosphere and the influence of a local water plume, the plasma interaction has to be simulated. 1304 A. and O I 1356 A. airglow radiation. The observed brightnesses of the reÑected solar C II 1335 A. A. ) of roughly 1È2, diagnostic of dissociative electron impact excitation of O Inferred vertical 2. Ocolumn densities are in the range (2.4È14)]1014 cm~2 for Europa and (1È10)]1014 cm~2 f2or Ganymede. with the satelliteÏs north and south poles. double-peaked line shape of GanymedeÏs O I 1356 A. feature implies the existence of a nonuniform distribution of Ñux, with signiÐcant enhancements that coincide with the satelliteÏs polar regions. This, combined with the recent Galileo detection of a magnetosphere and charged-particle population, raises the possibility that Ganymede possesses polar auroral emissions. roughly a factor of 100 greater than that emitted in the two O I multiplets. Thus the data suggest that the order of 109 watts are required to power the emissions at each pole, an electron energy Ñux of the same order as observed by Frank et al. (1997a). away from, Europa itself. This lends credence to the hypothesis that the plumes escaping from the ionospheres of Europa and Callisto are wrapped around Jupiter by corotation, survive against dispersion for a fairly long time and are convected radially by magnetospheric motions. We present simple models of plume acceleration and compare the plumes of the Europa and Callisto to the known plumes of Titan. point out the incompleteness of the present state of understanding of the atmospheres. abundances from Voyager PWS electron data. and atomic hydrogen are temperature independent and of comparable magnitude which they interpret to imply that H is created by the breaking of water molecule bonds at the surface at a rate comparable with the sputtering of water. Eviatar et al., 2001b). For the case of Europa, the simulation of Shematovich and Johnson (2001) predicts an atmosphere dominated everywhere by O2. A similar conclusion was reached with respect to both Europa and Ganymede from UV (Hall et al., 1995, 1998) and radio occultations (Kliore et al., 1997, 2002). In analogy with the analysis of Eviatar et al. (2001b) for an atmosphere over a sputtered ice surface, the dominant ion in the atmosphere is expected to be O+2 . found for Europa by Shematovich and Johnson (2001) and it is clear that an additional source of sputtered matter is required, especially, as Shematovich and Johnson (2001) point out, the yield of molecular oxygen in the ion sputtering flux is no greater than 20%. Shematovich and Johnson (2001) suggest electron sputtering which while inefficient is capable of deep penetration and of bringing out molecular oxygen. Paranicas et al. (2001) estimate the energy flux of electrons into Europa to be of the order of 1011 keVcm−2 s−1, which can provide a sufficiently large source strength of O2, of order 2 × 1010 cm−2 s−1, if the G value (O2 emitted per 100 eV of electron energy deposited) is as large as 0.02. Shematovich and Johnson (2001) used a somewhat lower estimate of the electron dose and found G>0.03 to be the required constraint. consistent with a density about two orders of magnitude greater than that of Europa and Ganymede. Despite the resulting high column density no corresponding aurora or air glow emissions above an upper limit of 15 R were observed (Strobel et al., 2002), which deprives the model of the ultraviolet observational constraints on the densities available for Europa and Ganymede (Hall et al., 1995, 1998). the intrinsic magnetic field (Eviatar et al., 2001a). No such mechanism capable of compensating for the reduced electron energy input exists at Callisto. It is thus to be expected that air glow and auroral UV emissions will be absent at Callisto without invoking a high conductivity ionosphere as proposed by Strobel et al. (2002). If indeed access to the surface of Callisto is denied by strong currents in the ionosphere, then it is not clear how a dense atmosphere and concomitant ionosphere can be created out of matter sputtered from the surface. (Maclennan et al., 1982). In the wake of Europa, on the other hand, the PLS measured velocity was at least 70% of the corotation velocity outside the wake (Paterson et al., 1999). Unfortunately, no information relating to the velocity of the plasma downstream of Callisto is available. ambient plasma density and Hm the scale height in the satellite ionosphere. For Titan where L = 20 and the conductivity is low, it is found that the plume cannot be accelerated in this manner. The acceleration rate is proportional to the Alfvén velocity and this quantity will be significantly larger in the environment of Europa than in that of either Callisto or Titan because of the weaker magnetic field and lower ambient density at Callisto and Titan compared to these values at Europa. A comparison of the Alfvén velocities at the three satellites, for nominal parameter values is shown in Fig. 5.